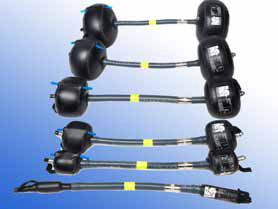 Argweld® Inflatable Purge Bladder Systems are the most effective systems available for pipe purging. 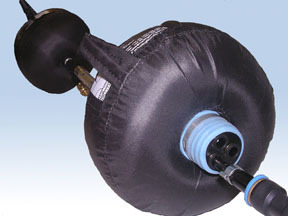 The system is pulled into position and inert gas is used to inflate the bladders (dams) which provide a 100% airtight seal on either side of the weld joint, after which the pressure in the system opens the purge valve and the gas purges the space between the bladders ensuring a clean, even penetration bead. Once the weld is completed, the gas is turned off and the bladders are deflated so the system can be pulled through the pipe to the next weld. These systems are specifically designed to be easily pulled into position through long sections of pipe and around elbows without the risk of getting jammed or stuck in the pipe. Click here to find out more about how Argweld® pipe purging equipment stacks up against other purging methods. The PurgElite® systems are the newest generation of the popular tandem purge bladders that have been an industry favorite for years. They have been re-designed to make them even simpler and easier to use, and more affordable than previous models. 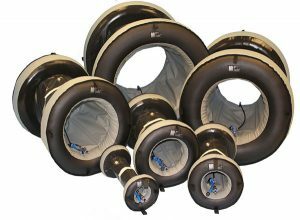 PurgElite® bladders have no valves to set or adjust, and they are the industry’s only inflatable purge bladders that can be used on 1” pipe and up. Just connect them to the inert gas supply and pull them into position for fast, effective and reliable pipe purging and clean, shiny welds every time. The latest version of the Argweld® Purge Bladder Systems is the Tandem Purge Bladders now offers multiple inlet / exhaust ports for faster, more effective weld purging. The user is able to increase the gas flow without fear of over-pressurizing the weld by utilizing additional inlets / exhausts while maintaining a non-interference seal on the pipe ID. The multiple exhaust ports can also be utilized to accommodate a pressure gauge to monitor gas pressure for orbital welding. This is an important new feature added to the already popular Argweld® Tandem Purge Bladders. Available in sizes for 1.5” through 7” pipe. 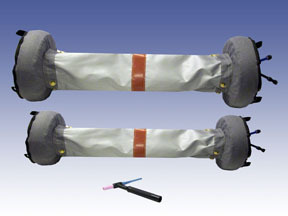 The sleeve contains flexible supports that maintain the shape of the larger bladders even when deflated so that when they are pulled into position and the gas is turned on, they automatically seat themselves properly in the pipe and provide a 100% airtight seal on either side of the weld every time. The support of the sleeve prevents the bladders from folding over or getting jammed up while providing enough flexibility to allow the system to be pulled through long sections of pipe and around elbows with ease. The sleeve design also further reduces the amount of air volume that needs to be purged, which dramatically speeds up the process. Not only do the inflatable dams isolate the section of pipe around the weld joint for purging, the sleeve eliminates the majority of volume between the dams, making this the fastest purge system available. In side-by-side comparison studies Quick-Purge™ systems have proven to be up to 8 times faster than foam, paper or other conventional pipe purging methods. These systems are rugged and durable, designed to be used over and over to produce hundreds of clean, high-quality welds. The sleeve and inner portions of the bladders are all made from heat-resistant silicone material to withstand the high temperatures encountered in the welding process. Available for sizes 8” and up. Purge Bladder Systems based on the Quick-Purge™ design, modified with longer sleeves and completely encased in heat-resistant materials to handle the higher temperatures encountered with pre-heat welding processes on chrome and other exotic pipe materials. This uniquely designed system has become an industry standard worldwide for applications involving stainless steel, chrome or other types of pipe that require an oxygen-free weld. The Argweld® systems are used extensively at LNG sites, refineries, power plants, food processing and pharmaceutical facilities and fabrication facilities. Compared to other methods of gas purging for pipe welding the Argweld® Purge Bladder systems have a number of distinct advantages that lead to consistently clean welds and significant savings. Reliable. A good purge can be achieved and maintained every time without the fear of the dams becoming dislodged or compromised during the weld process. Faster. These systems are the fastest method of pipe purging by far with no time wasted building, taping or gluing dams in place, and no time wasted purging long sections of pipe. Due to their superior design, the purge time required is up to 8 times faster than foam, paper or other conventional purging methods. For example, an 8” pipe can be purged to less than 1% O2 in less than 60 seconds and a 12” pipe in about 90 seconds. Use less inert gas. Argweld® purge systems also offer huge savings from reduced gas consumption for weld purging. They typically use less than 1/3 of the amount of gas required with other types of purge dams. Easy to use. Argweld® purge bladders greatly simplify the process of inert gas purging. With minimal training bright shiny welds that pass inspection can be achieved in no time. As a result of the reduced waiting time, faster purge times and reduced gas consumption Argweld® purge systems pay for themselves in just a few welds. Don’t put your weld at risk with “make-do” devices that can tear or become dislodged and end up costing time and money.